A unique Elisia diamond onyx gold ring from Bulgari, featuring round brilliant cut diamonds, onyx, and chalcedony set in stunning 18k white gold. 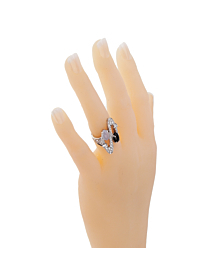 This ring sparkles and shines and is sure to make an impression. 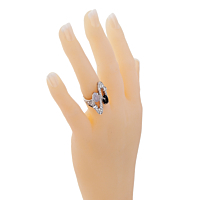 The onyx and chalcedony add a chic touch to this otherwise full-on glamorous ring. The unique design of two white gold rings really brings something special to this piece.